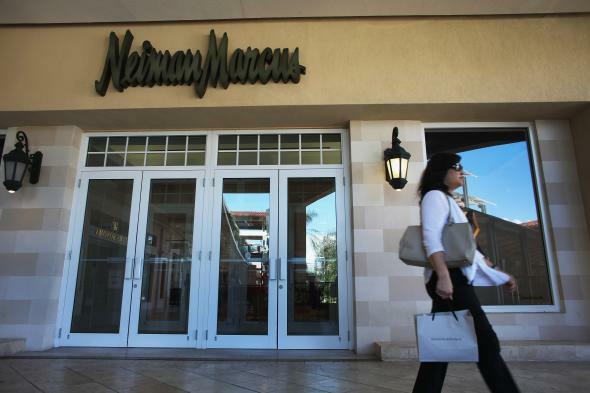 Even the rich are sick of Neiman Marcus. The woes of American retailers aren’t confined to those that cater to the struggling middle class, whose incomes haven’t budged in ages. Retailers that cater to the carriage trade are having a tough go, as well. Polo Ralph Lauren recently announced it would shutter a massive store on Fifth Avenue. And now, as Suzanne Kapner and Ryan Dezember reported in the Wall Street Journal print edition on Monday, Neiman Marcus seems to have run into some trouble. * The Dallas-based chain, long known for its Texas-over-the-top holiday catalogue, obsequious customer service, and tastefully glitzy stores, would seem an unlikely victim of the current economic environment. But it offers a surprising sort of case study in late capitalism. How do you lose money operating a fabled emporium of extreme consumption in an era of extreme inequality and highly conspicuous consumption? Neiman Marcus is showing us how. In 2013, Neiman Marcus was sold by one group of obscenely rich people—the private equity firms Warburg Pincus and TPG—to another, a consortium of the private equity firm Ares Management and the Canada Pension Plan Investment Board. Even though the company was already laden with debt, this seemed like a good idea. With wealth concentrating ever more, and growing faster than the rate of growth, America’s grasping upper class would have more money to spend. By swaddling them in loving customer service and appealing to snobbery, Neiman Marcus would be able to sell the rich all sorts of goods at very high margins. It could jack up prices year after year and the customers wouldn’t mind. And in theory, online retailers posed less of a threat to the department store’s business. After all, part of the point of buying the stuff that Neiman Marcus sells is to be seen buying it in public. And many luxury-goods manufacturers tightly control the channels through which their products are sold. So here’s the theory: As rich people got returns on their investments, they would spend money at Neiman Marcus’ holdings—42 Neiman Marcus stores, two Bergdorf-Goodmans, and a bunch of outlets. That would enable the really rich owners to pay off the really rich bondholders, and then cash out by selling the company to the public. Everybody wins! At the same time, designers and manufacturers are becoming more willing to have their goods sold online. And so upstart luxury online retailers like Farfetch.com and Matchesfashion.com are having a twofold impact on the business: They are taking a small bite out of sales that used to belong to Neiman Marcus; and by creating greater price transparency, they are placing pressure on margins. “Over a recent 24 hours, Farfetch’s prices averaged 2% lower and Matchesfashion’s 15% lower than Neimanmarcus.com’s prices on 32 identical items, according to price-tracking firm Market Track LLC,” Kapner and Dezember reported. And so even as the markets have boomed and the wealthy have continued to amass more capital, Neiman Marcus’s sales have struggled. In the recently concluded quarter, which included the important Christmas season, same-store sales were off 6.8 percent from the year before. That was the sixth-straight quarter in which same-store sales have fallen. Total sales in the final quarter of calendar 2016 were $1.395 billion—only 2.4 percent higher than they were in 2013. Because Neiman Marcus spends heavily on staff and on capital expenditures to keep the stores looking fresh, the stagnant sales have taken a toll on margins. In several recent quarters, the massive interest bill on the company’s $4.4 billion in debt—about $74 million per quarter—has outstripped operating earnings. An initial public offering would have provided an infusion of capital to help pay down the debt, but the poor operating results have put that off the table. And so, as the Journal noted, some of Neiman Marcus’s bonds are trading at distressed, bargain-basement levels. All of which puts the company in a strange place. The temple to profligacy may have to turn to austerity—cost-cutting, restructuring, slashing overhead—in order to survive. And the ultimate upscale retailer may have to go down-market in order to survive. Its salvation might come in the form of a sale to a competitor like Hudson’s Bay, which operates Canada’s Hudson’s Bay chain, as well as Lord & Taylor and Saks. Which would be a little like Tiffany selling itself to Zales. Correction, April 18, 2017: Due to an editing error, Neiman Marcus was originally misspelled in the headline of this post. Update, April 18, 2017: This post has been updated to clarify when the Wall Street Journal story was published.